Welcome to Ocean Villa, a sprawling hilltop retreat that's perfect for a large group in search of a secluded, upscale hideaway. 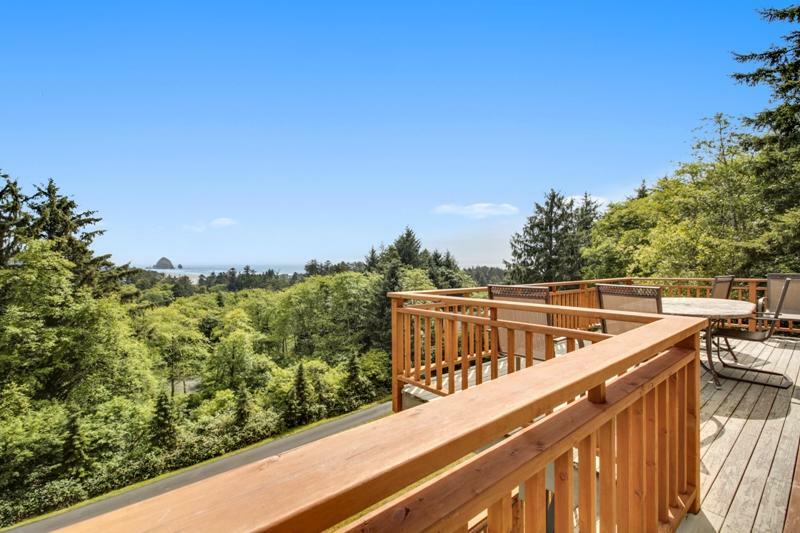 Located in the quiet north end of town on scenic Ecola Park Road, this six-bedroom, four-and -a-half bathroom home boasts plenty of natural light, hardwood throughout, and unfettered coastal views that stretch for literal miles. The entry opens into a large, vaulted living area outfitted with fine furnishings and some very compelling coastal art pieces, plus a wood burning fireplace perfect for warming your tired toes at the end of a day of exploring. A dedicated dining area offers the ideal setup for those more formal occasions, while the large kitchen with its endless counter-tops can easily field a crowd of cooks. You may well find yourself spending the lion's share of your time out onto the enormous deck, where you can admire panoramic views of the ocean and the mountains - with Haystack Rock towering in the distance. This large outdoor area is fully equipped to entertain a crowd, so why not take your meals in the open air? Sleeping accommodations abound: be the first to call dibs on the large master bedroom with king-sized bed and balcony. 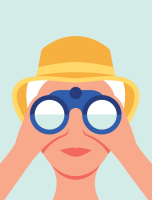 It's got ocean and mountain views, plus a private bathroom with jet tub and shower. Also on the main floor: a cool and quiet bedroom with a queen bed and a well equipped bunk-room for the kids, both featuring forest views. Downstairs, the views keep on coming throughout the sleeping and common areas. A large room with a queen bed, daybed, and trundle offers a fun sleeping setup for younger guests, while a second room with a queen bed will appeal to adults. The third bedroom downstairs features a king bed with a private bath and amazing views. 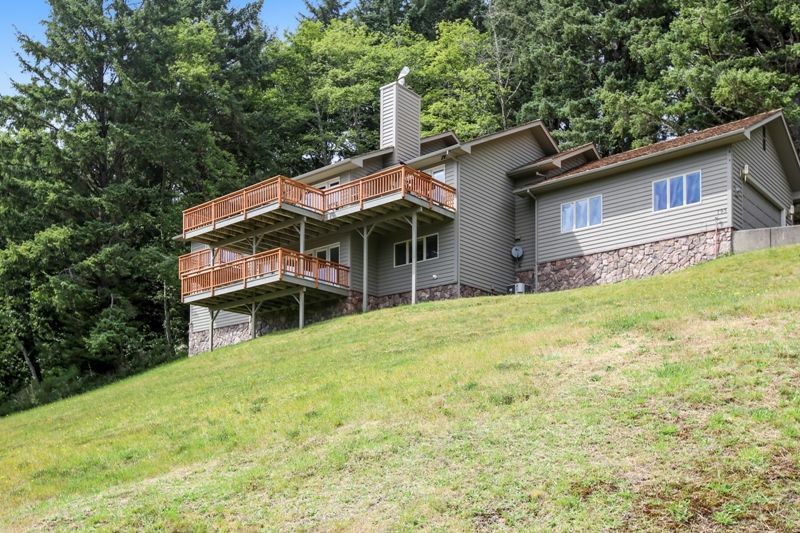 An enormous den with wood stove and entertainment center completes the downstairs layout along with another large deck and more views! 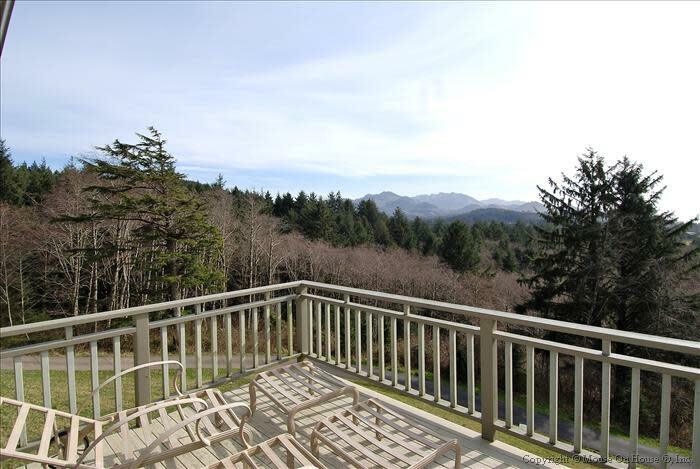 Make your vacation bigger than life in this private and oh-so-luxurious Cannon Beach treasure. Just a quick 1/2 mile to the beach and town, walkable for the adventurous, Ocean Villa is sure to soothe your soul and secure Cannon Beach as your family's favorite vacation destination.